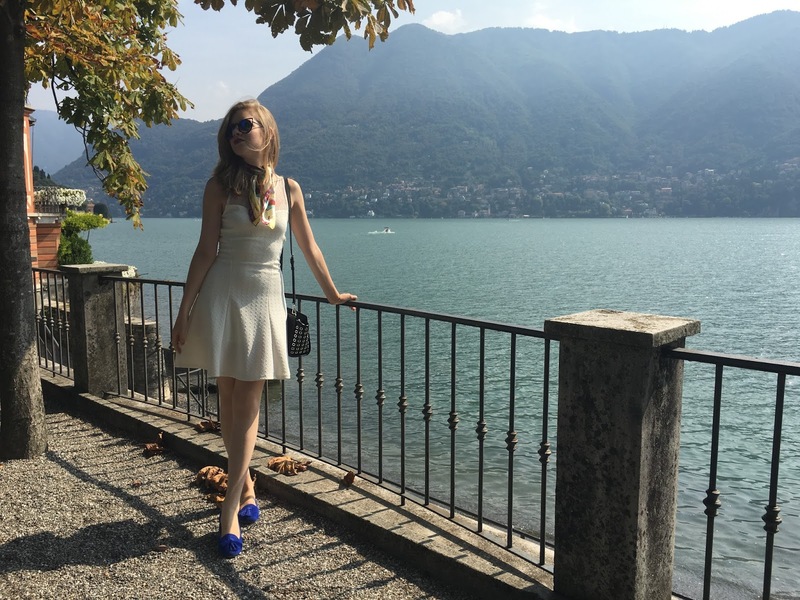 Today's pictures were taken in beautiful Como, where I decided to wear a semi elegant outfit consisting of a white dress and royal blue loafers. I know in USA there is the rule of not wearing white after Labor day, but I don't live there and fashion rules are meant to be broken anyway, right? As you can see the dress has beautiful lace detailing from the neck to the chest and on the back, dropping in a low v. This detail makes the look a bit flirty. For even more playfulness, I added my silk neck scarf. That place is gorgeous! I personally wear white all year round. What a gorgeous place to be, I love the combination between your scarf and the shoes! I love your dress! The scarf is a perfect touch! Beautiful photos! Love the dress and the blue shoes combo! What a gorgeous background too! There's no fashion or beauty rules or at least that's what I think. Wear anything that makes you feel confident, that's the only rule. You look lovely with that white dress and I love the pop of colour from your loafers. Wow, this place absolutely looks amazing! love your outfit and the pictures! Lace is always a nice choice! Such a gorgeous outfit for a gorgeous setting! I would love to visit here! This is such a beautiful place. Your dress is amazing. Such a lovely dress and place ! Nice Outfit. Lago di Como is a gorgeous place. Lake Como is just so beautiful! I just put up some posts from the lake too. I just love it there. So jealous, I desperately want to go away on my travels already! All white is so simple, I love it. Gorgeous snaps lovely! Lovely outfit, and beautiful scenery. Lovely outfit and amazing back detailing - I liked the shoes too, and the beautiful pictures at Lake Como. You look always very beautiful! I liked your on facebook now! Hope you have a nice week! I love your blog! Your pictures are gorgeous!! love the outfit!! I love your dress. So pretty and the shoes are cute too . So gorgeous! Love that dress! I really like how you have combined this white dress with blue shoes, that looks lovely. Also, I really love the view - nature is so beautiful! I have never been at the Como lake but definitely want to go there! You look stunning in white and beautiful location! First time I'm hearing of no white after labour day! I wear whit often! This is lovely! I love the white dress with that bag, the eyelets are great on it! I'm for wearing white in the fall, especially if the weather is this nice! Carina, this is such a beautiful photoshoot! I love your lace dress and how you are wearing it with a neck scarf:) I am totally wearing white after Labor day as well, since I've got quite a few white jeans in my closet and I don't want to put them away until next summer, lol. Plus, it's such a silly rule that was broken by fashion icons many times. Anyway, thanks so much for sharing and have a great day ahead! What a wonderful photo! Charming place and beautiful outfit! What a positively dreamy place! And I love your cute little blue shoes! We don't have the labour day rule here in Australia either! You look so nice in white! 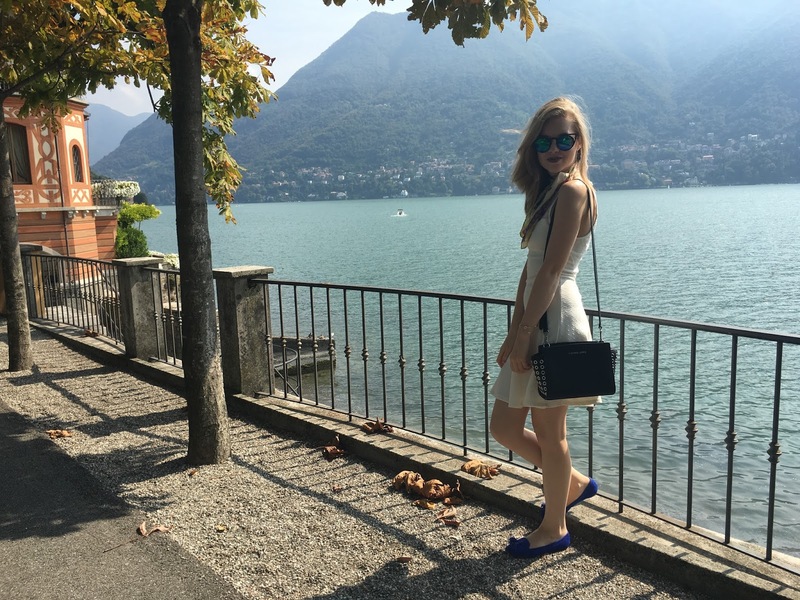 Beautiful photos - Como is a lovely setting and I love your white dress (I wear white all year round! ), which is perfect with the blue loafers! What a gorgeous look for a summer holiday :) You look so pretty! The dress, the location... Everything looks perfect! This place looks beautiful, so stunning. Love the simple white dress. This place is absolutely beautiful! Love your white dress and the cobalt blue ballet.